A rare teddy was the star lot at a Cotswolds auction of antique toys yesterday (Thursday, September 29) when he was sold for £900. There was stiff competition for the handsome 1950’s Deans Rag Book Co, Tru-to-Life bear designed by Sylvia Wilgoss, when he went under the hammer at Moore Allen & Innocent in Cirencester. With his with golden mohair plush, brown eyes, black nose and moulded rubber padded paws, and standing at 65 cm high, the bear proved irresistible to bidders, who flocked to the saleroom from across the UK – and from as far away as Northern Europe – to bid against collectors from America, Japan, Russia and Estonia who placed their bids by phone and email. Thousands of individual toys were sold in 700 lots on behalf of the owners of the famous Park House Toy and Collectors Museum in Stow-on-the-Wold which closed in June. 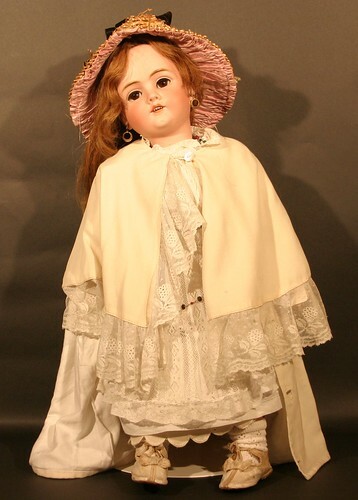 Highlights of the dolls section included £500 paid for a 69cm tall Walkure bisque doll with feathered eyebrows, sleeping brown eyes, open mouth, four upper teeth and pierced ears; £400 for a set of Madame Alexander Quintuplets, each with matching original clothing and bonnets and standing at 8cm high; £360 bid for a Chad Valley set of Snow White & Seven Dwarfs figures, each with felt and cloth body, with Snow White standing at 41cm high and the dwarfs at 16cm; and a Pedigree “Shirley Temple” doll with golden curly hair, sleeping blue eyes, open mouth and two upper teeth, with fitted voice box, wearing a strawberry printed dress and standing at 58cm high, which was bought for £340. In the bears section, an unusual pair of bears in wedding outfits, and accompanied by their own portrait, made £460. The circa 1910 blonde plush boy bear, at 58cm high, and an early 20th century blonde plush girl bear, at 51cm, were sold with A Study of Both Bears Dancing in pastel, signed Phyllis Nelson and dated 1991. 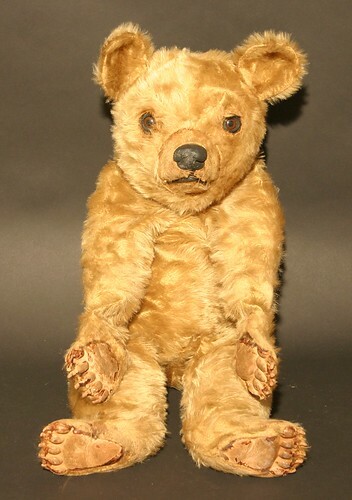 And a 1950s Chiltern Hug-Mee blonde plush bear, standing at 62cm high, made £360, while a modern Steiff collection of Noah’s Ark animals comprising seven pairs including bears, giraffes, lions, donkeys, llamas, elephants and gorillas, manufactured to a limited edition of 8,000, made £360. In the Pelham Puppets section, a Pelham Puppet Theatre with 32 various puppets including Ogre/Giant, Dragon, Hansel & Gretel, Ermintrude, Rupert Bear, The Horse, Mickey & Minnie Mouse, Pinocchio, Goofy, Caterpillar, Witch with guitar, Gypsy Fiddler, Animal plus drum, Donald Duck, Pluto, Snake Charmer, Skeleton, The Frog, and more achieved £500, as did a Victorian doll’s pram in green leather on a wrought iron frame. 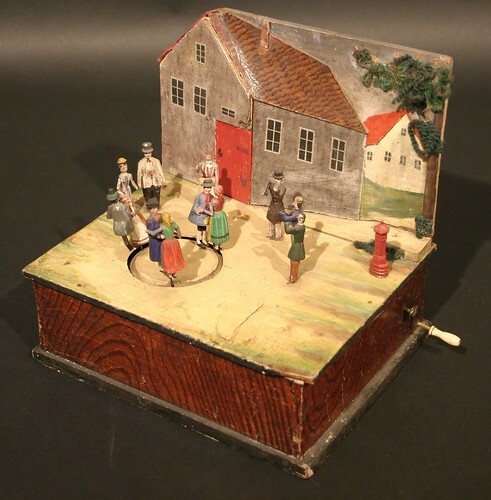 Mechanical toys also performed well: a 19th century Continental mechanical toy as a group of figures dancing before a house, with hand wide musical action sold for £560 against an estimate of £100 to £150 – the second-highest lot price of the day – while a 19th century Continental mechanical group as a street performer with musical box and dancing cat, dog and rabbit made £340. Elsewhere, a wooden painted pedal car achieved £460, and a World War I balsa wood biplane with a wingspan of 1.3m made £420. The day was not without a few surprises: A quantity of around 50 bisque and other cake decorations and other decorations including Father Christmas, gnomes, Puss in Boots, Bonzo, and robin, together with a bisque figure of a mouse entitled Teddy Tail by Hewitt Bros. Willow made £480 against an estimate of £50 to £80. And a Japanese tin plate clockwork airship, valued at £40 to £60, made £280. In all, antiques toys valued at nearly £50,000 were sold during the auction. You are welcome to contact the auctioneers through the website (www.mooreallen.co.uk), by phone (+44 1285 646050) or by email (finearts@mooreallen.co.uk) but you’d need to get your possessions to the salesroom in Cirencester, UK. Your email address suggests you’re in South Africa, so it might be you look for an auctioneer closer to home. Of course, if you’re in the UK, or you feel the UK market would be right for what you have, do contact them!